Our in-house wheel repair services get the job done faster and for less. Our goal is to offer the best rim and wheel repair, refinishing, and auto body services available at affordable prices to get you back on the road in no time. Rim Guard Type Wheel Repairs and Refinishing...for LESS! Experience Makes the Difference! We offer a full range of wheel and rim services to businesses and individuals in Raleigh, NC and beyond. Our wheel technicians are ACU-TRU® Certified adhering to strict standards for quality and safety. Auto Recon Pros are Raleigh's auto body experts, helping customers repair everything from minor dents to auto accident damages. We have the knowledge to repair even the most challenging collision damage on all makes and models of domestic and import vehicles. 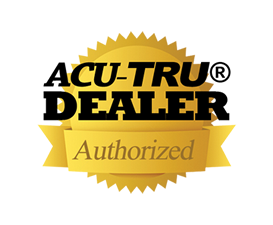 As an Authorized ACU-TRU Dealer we adhere to strict ACU-TRU standards for wheel repair and sales. This means that every wheel we repair and sell is guaranteed to be tru, straight and subject to our six-point check inspection before it leaves our facility. Call us at 919-828-2223 for a free quote or more information on the various wheel repair/refinishing services we offer. The ACU-TRU® Wheel Repair System is the nation's foremost wheel and rim quality control system offering expert training in wheel repair & restoration, proprietary wheel straightening equipment and regional licensing for ACU-TRU® Authorized Dealers. Safe and reliable remanufacturing guidelines are adhered to throughout the wheel repair process. Mobile and On-Site Wheel Repair Now Available! We specialize in repairing bent, cracked, corroded, blemished and curb rashed rims. We Offer: Expert Rim Repair, New Rims, New Tire Sales, Factory Replacement Wheels. Copyright ©2019 Raleigh Wheel Repair. All Rights Reserved.